Darby English is the Carl Darling Buck Professor of Art in the Department of Art History. His teaching and advising address subjects in cultural studies as well as modern and contemporary American and European art produced since the First World War. 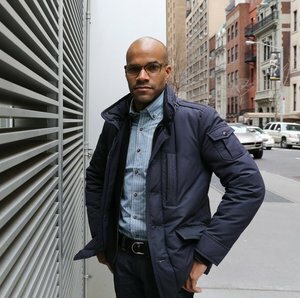 He is associate faculty in the Department of Visual Arts and the Center for the Study of Race, Politics, and Culture. In 2010, English received the University of Chicago’s Llewellyn John and Harriet Manchester Quantrell Award for Excellence in Undergraduate Teaching, the nation’s oldest such prize. Darby English’s research probes art’s interaction—at the levels of its production, description, interpretation, and analysis—with instituted forms of historical subjectivity and experience. Recent research has focused on artistic and other cultural manifestations of optimism, discomposure, and interculture. More theoretical formulations of English’s work examine the difficulty of studying the foregoing themes at once as historical objects in themselves and negotiating their implications as sources of anxiety about historical change. For this work, English has been the recipient of fellowships and awards from the Clark Art Institute, the Institute for Advanced Study, the National Humanities Center, the National Endowment for the Humanities, the Andy Warhol Foundation for the Visual Arts/Creative Capital Foundation, the Getty Research Institute, and the College Art Association, among other bodies. English’s short-form writing has appeared in Art Bulletin, Artforum, caareviews, The Guardian, The International Review of African-American Art and other venues. English is the author of 1971: A Year in the Life of Color(University of Chicago Press, 2016), and How to See a Work of Art in Total Darkness (MIT Press, 2007). He is co-editor of Art History and Emergency (Yale UP, 2016) and Kara Walker: Narratives of a Negress (MIT Press, 2002 and Rizzoli, 2007). A new monograph, To Describe a Life: Essays at the Intersection of Art and Race Terror will be published by Yale University Press in 2018. This book synthesizes material first presented as the Richard D. Cohen Lectures at Harvard University in November 2016. In 2014, English gave the twenty-sixth annual Hilla von Rebay Lecture at the Solomon R. Guggenheim Museum, New York, and in 2015, the Israel Rosen Lecture at Johns Hopkins University. In autumn 2017, English gave the FORART Lecture in Oslo.